As a long time Cascades Developer you always have used Pixels to define sizes, margins or paddings – so the challenge is to rethink and use ‘du’. 8 buckets means you need 8 Pixel for each Design Unit (du) on a Z30, but 12 Pixel on a Passport. Now it’s easy to understand, why a Padding value of 48 Pixels looks different on the devices: 48 Pixel on Z30 are 6 du (48 / 8), but only 4 du (48 / 12) on a Passport. In part 6 we already discussed how Cascades is looking for Images from density-dependent folders like 10ppd, 12ppd, … These folders are important if you need images for ActionBar, Tabs, Menus … where Images are only defined by their name. For Images not found, Cascades is looking if there’s an Image with higher density and scales it down. If there’s only an Image found with lower density or from root, this one is used without upscaling ! What about your Images defined by ImageView ? If you only provide the ImageSource, Cascades will try to find the right one – which means looking into your ppd folder and use the Image found without scaling. If not found, Cascades takes a look at ppd folders with higher density: if the Image was found, Cascades will scale it down. If not found Cascades takes a look at ppd folders with lower density: if found the Image will be scaled up ! This is different from ActionBar / Tab / Menu – Images where Cascades only scales down ! Attention: If the Image was found in the root folder, Cascades will use it without any scaling ! This can cause Images to become larger or smaller as expected. It’s always a golden rule: place all your Images into ppd folders ! Only Images used with fixed Pixel Size can remain in the root. If you have to leave your Images in assets root, there’s a workaround. To guarantee same size on all devices set minWidth, maxWidth and minHeight,maxHeight for ImageView – of course using ‘du’. 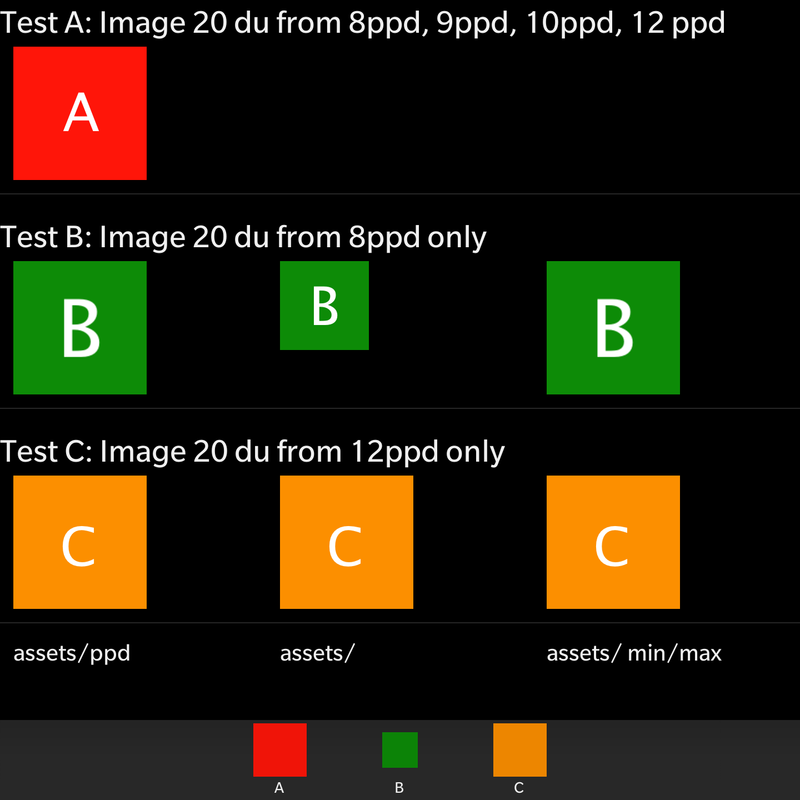 The example above (240×240 Pixel on passport) can be defined as an ImageView with 20 du width / height. Now Cascades knows: this Image should be 240×240 Pixel on Passport and 160×160 Pixel on Z30. Same story again: find the Image from 12ppd folder only Cascades will scale down to 160×160 Pixel on Z30 – finding the Image only as 160×160 inside 8ppd, Cascades will scale up to 240×240 Pixel on Passport ! Don’t forget to set the ScalingMethod ! Sounds confusing ? Only the first time ! From ‘B’ in the middle you see 160×160 px are smaller then 20 du (240×240) if used unscaled from root. From ‘C’ in the middle you can see the too large image with 240×240 unscaled on Z30. The ActionBar on Z30 is OK because ‘C’ was downscaled automatically – on Passport ‘B’ is too small because Cascades doesn’t upscale for ActionBar Images. You still need some Images Device-specific for Absolute Layouts or fine-tunied backgrounds or special Covers ? Place them inside static assets folders like 1440×1440 for the BlackBerry Passport. Exist some formula with relationship of bucket and density screen.